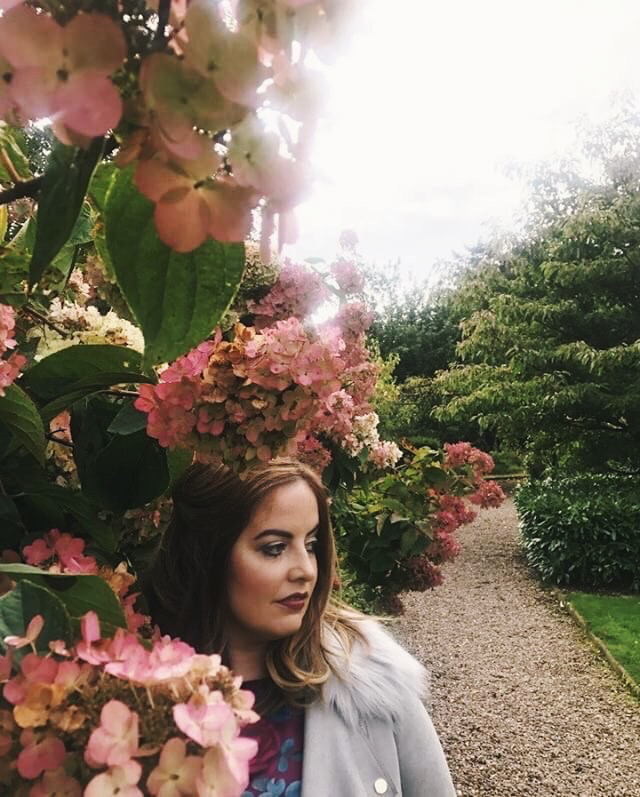 On Sunday, September 24th, 2017, the lovely Emma of @littlewoodlife held the very first 'Bloggers Retreat' in Northern Ireland. Set at the stunning Larchfield Estate, 140 bloggers and bloggers-to-be from all across our wee island gathered in anticipation. Anyone who knows Emma, knew that the afternoon would be styled to perfection; add to this the awesome line up of speakers (@melwiggins, @blossomingbirds etc) and afternoon tea provided by French Village and we were set for a wonderful time! This feels like a really special post for me as I wasn't supposed to be at this event at all! I completely missed out on the posts advertising the retreat so when Nic of @thebrightsidediary (check out her new blog!) asked me if I was going, I was gutted. I immediately contacted Emma and expressed my disappointment, asking her if she was planning to do another one (all the while secretly praying she'd say yes!) She instantly replied saying I wasn't going to believe it, but someone had just pulled out and their ticket was available! I was delighted! The timing of this retreat for me is quite significant and I was so excited to see some IG faces in real life and learn some tricks and tips from the pros. As Sunday approached I was a bundle of nerves and excitement. I must have tried on a gazillion outfit choices and looking back I wish I'd gone with my gut. Not that I hated my outfit, I had borrowed the skirt from my sister so I just didn't feel like 'myself' - you know what I mean? We all have individual taste; have faith in that and own your personal style - it makes you, YOU! Stunning right? I felt a little bit like I was at a wedding; everything was beautifully styled and there was a magical atmosphere right from the get go. On our arrival we enjoyed treats and drinks by @panaceadrinks, @clearer_water and @grahamsbakery - I very quickly spied the beautiful Erin of @motherbeastie and made a bee line her direction! It is so amazing to finally meet people in the flesh who I have followed on IG for so long! It's the weirdest thing as you feel you know so much about them, yet have never met face-to-face. Thank you Emma for giving so many of us the chance to get together. The buzz of the sharing of experiences and IG accounts, the encouragements and the, 'it's so good to finally meet you' 's was something so special. It wasn't long before Emma took up her space (see what I did there Mel!) and welcomed us with her unique warmth and flair. One selfie IG story later and first up was Anna of @blossomingbirds on 'Instagram Tips and Tricks'. Anna, with her famous honesty and humour, guided us through some really useful tools for IG and excellent advice on building brand and content. Next up, the Photo Walk. My aim was simple - be in as little photos as I could! That is definitely not my thing. I spent most of my time watching and learning in complete awe as Mel and Nic confidently snapped away and posed comfortably for the camera. They encouraged others to give it a try, speaking positive truth and complimenting our best features - it was beautiful. It was pure joy to walk round the gardens of Larchfield with a bunch of fab girls who are passionate and fun and most importantly, don't take themselves too seriously! Unfortunately we missed out on the props that Emma had provided ... huge confetti balloons and helium letters - all such fun and helped to create some fabulous shots. Then it was time to eat! French Village catered the event and honestly, the selection was heavenly: a selection of delicious sandwiches, 3 tiers of mini desserts, scones with jams and clotted cream with tea/coffee. Scrumptious! Creativity, especially for adults, requires us to be vulnerable. It is only out of complete vulnerability that we can begin to unleash our truest, purest creativity. 1. Find your niche - What is it that you love? What gets you passionate? 2. 3 focal points - There is something about the rule of 3. What 3 areas or passions do you have or want to develop? 3. Take up your space - There is always room for your voice. 4. Comparison versus Community - Comparing yourself to others will never, ever benefit you. Mel on fire - totally inspired! The last seminar I was able to hear was the brilliant 'Blogging for Business Panel' with Rachael Martin of @thebretonbird, Laura-Ann Barr of @all.thats.pretty and Anna Corry of @blossomingbirds. The girls discussed some of the practicalities of business blogging along with some honest stories of their own experiences. I was raging to miss Andrew and Colin's 'Life as an Insta-Partner' speech but I had to head off early! I did hear that it was hilarious though so well done lads! Check out @littlewoodmr and @father_of_the_birds for the male perspective of Emma and Anna's antics! Honestly, it really was the most wonderful retreat. It took a lot for some people to even go; real courage and bravery to step up and be counted. I'm so glad I did - I left feeling inspired and encouraged, feeling privileged to be part of a growing community of passionate people who support one another instead of tearing each other down. Emma Martin, your bravery and creativity just shone! Never stop inspiring those around you. Well done and thank you for creating a space for like-minded people to feel safe and get some royal treatment - we loved it! When's the next one? !